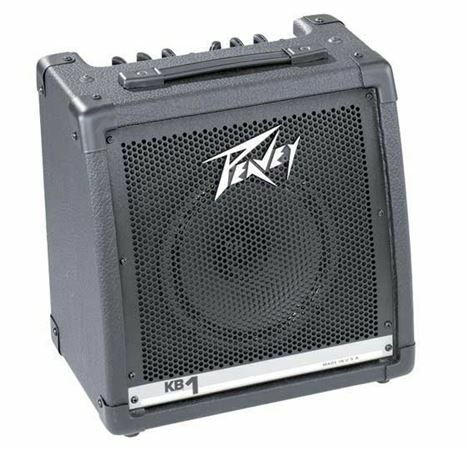 Order your Peavey KB1 Keyboard Amplifier from AMS and enjoy 0% Interest Payment Plans, Free Shipping, Free Extended Warranty & 45 Day Money Back Guarantee. A great 20-watt practice amp, the KB1 keyboard amplifier features 2 separate channels, an 8 inch speaker, a headphone output and 2-band EQ. Designed as a PA system in a keyboard amp, the incredibly versatile KB1 amplifier features independent channels that can easily handle vocal microphones, acoustic and electric guitars, drum machines and backing machines such as CD and DAT players. The dynamic angled baffle boards enhances the KB1's coverage area by angling the speakers up toward the user and audience. Whether you need clean, pro-quality compact amp for your rehearsal room or a full-featured powerhouse that doubles as a portable PA, Peavey's got you covered. Does what it suppose to. Well for 20 watts she a loud little ****!!! Keyboard amp indeed also works great a stereo amp for a stereo guitar processor!!! Not what I was expecting! The quality was not what I was expecting! A lot of music for such a little amp. I am well pleased. Great price for the kick that this amp gives! Not alot of stuff to play with, but the 2 separate channels are really nice. For a small amp it sounds really good. You're not getting on stage with it or anything, but for a studio or for practice it sounds great. It is definitely worth the money.